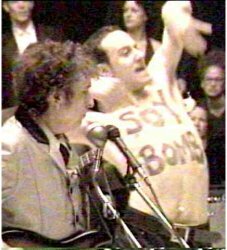 I’ve got a mishmash of interesting notes about musicians who have played around with this sort of thing (and peripherally relevant items like, say, the Soy Bomb Nation). 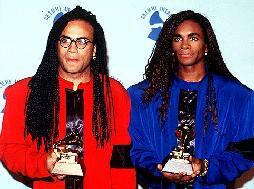 How hard it seems for people to forgive Milli Vanilli. As if anyone who tapped their toes to the catchy tunes or rocked out at one of their concerts was doing so out of enthusiasm for the artistic integrity of the performers. “Droplifting” is like shoplifting, but even more fun. You make your own recordings of miscellaneous oddities, burn them onto a CD, add some interesting cover art, and sneak them onto the shelves at music stores. Some clever musicians-rights advocates are battling MP3-based piracy by spiking on-line distributed music databases like Napster with MP3 files they call “cuckoo’s eggs” that are named as though they were reproductions of copyrighted songs but which actually contain other sounds. See the Evolution Controlled Creations page for more interesting Napster hacks. The musical group known as KLF, incorporated culture jamming tactics both in their music and in their extramusical antics, which included setting fire to £1,000,000. Fritz Kreisler, a fine violinist, had a hard time finding an appreciative audience for his own compositions, so he started writing them in the style of famous composers and passing them off as obscure or recently-uncovered works of the great masters. The BBC broadcast what it claimed to be the avant-garde composition of a Polish visionary but what was in fact the work of BBC employees making random noise. “We dragged together all the instruments we could find and went around the studio banging them.” The composition, Mobile for Tape and Percussion by Piotr Zak was a twelve-minute cacophony that merited serious reviews in the Daily Telegraph and the London Times before the hoax was revealed. And in a sort of harmony with Mr. Zak, there is the famous diva Florence Foster Jenkins, whose singing was so awful that she sold out Carnegie Hall in her final performance. Hip irony, circa 1944. Impersonating a deejay is one thing, but try impersonating the entire Moscow Philharmonic. Jello Biafra has been known to get creatively confrontational. And the “artists of appropriation” known as NegativLand have become audio outlaws for flying in the face of copyright laws in their relentless parody. The punk rock anarchists known as Crass pulled a few pranks in their day. They arranged to include a flexidisk of a song called “Our Wedding” in the teenybopper magazine Loving . Nobody at the magazine had gotten around to actually listening to the song first, though, and they had to apologize later for including this “sneering attack on love and marriage” with a title “too obscene to print” in their magazine. Check out our News Trolls section for info about another great Crass hack. On the Magnus-Opus page you can learn about the musicians who have written a number of compositions that, well, correspond to every tune you might hear when punching in a phone number. The good part is they’ve copyrighted their work. I hope you’ve been paying your royalties when you reach out and touch someone by performing one of their compositions. Gotta put in a plug at this point for pirate radio broadcasters and fans. You’d be surprised at how easy it is to get on the air. Check out the pirate radio transmitter in a briefcase that Space Hijackers Architects Ltd. put together. In the United States, “local” radio stations are increasingly being taken over by a small number of huge national companies that replace local content with canned DJ simulations and a one-size-fits-all setlist. Negativland organized a group of pirate radio stations in Seattle, Washington, to simulcast a revealing parody of one of these stations. Perhaps you’ve heard of 4'33" , a John Cage composition that consists of a pianist sitting down at a piano and playing not a single note for four minutes and thirty-three seconds. More recently, an artist put out a recording that included a sixty-second track of silence — and John Cage’s music publisher has sued them for unauthorized sampling! And it’s hard to let a discussion of musical hoaxes go by without mentioning the hyperactive rumor that Paul McCartney is dead and that his death has been kept a poorly-guarded secret. Another Beatle-related hoax had to do with unreleased recordings supposedly hiding in the vaults for decades. The rumors, started on a whim by a fellow named Martin Lewis, have found their way into scholarly discographies and numerous writinge on the Beatles oeuvre. But the missing songs were never recorded, or even played, by the fab four.